DENFAIR 2018 - Australia finally has a design fair with heart. It has to be admitted straight from the outset that Australia is a very small market and this goes someway to explaining why traditionally the country has failed to have a world quality design fair. Some would argue that it still doesn't by comparison to Stockholm, Milan and London but it's definitely getting there through DENFAIR. The DIA (Design Institute of Australia) stand 10:10 with native fauna canopy. The fourth DENFAIR event was once again held at the Melbourne Exhibition Cente in the city's Docklands. It's not the most inspiring venue (locally known as 'Jeff's Shed' after the politician who championed its construction) but it's very central for visitors. This year saw an increased number of European companies testing the waters by taking a stand at the fair - these included Fermob, Expormim, Dedon and Established & Sons. Rather than this being done under the banner of the local distributor, the stronger recognition factor of international brands was exploited. All in all there was still only two hundred stands but that creates quite an intimate mood and enables the most thorough visitor to see everything properly in a single day. The Halcyon Lake stand featuring Columbian rug brand Ames with rugs by Sebastian Herkner. Shown on the wall are his 'Nudo' rugs on the floor are his 'Nobsa' rugs. The 'Nobsa' rug in terracotta by Sebastian Herkner for Ames. Traditionally very strong in the furniture market, with brands like Fast, Mattiazzi and Norman Copenhagen, Australian distributor District is branching out into lighting with exciting new brand Giapato & Coombes. The hip Italian brand joins District's other brands with a strong lighting focus like Resident and NEW WORKS. The District stand at DENFAIR, a translucent enclosure to launch Italian brand Giapato & Coombes to the Australian market. Giapato & Coombes on the District stand. Shown here is their wonderful 'Cirque' light fitting (1 large 3 version). The Australian lighting brand Rakumba celebrated 50 years in business at DENFAIR 2018. The Melbourne brand launched a wonderful new range by Rotterdam based Australian designers Studio Truly Truly called 'Typography' along with other new designs by Jon Goulder, Anchor Ceramics and Tom Fereday. Their stand was once again a knockout with layers of delicate strings in white and yellow forming the perimeter of the stand while their latest lighting ranges were displayed inside. The Rakumba stand with their 'Stone Cow' pendants on the left and Studio Truly Truly's new 'Typography' on the right. One of many variations available in Studio Truly Truly's Typography collection produced by Rakumba. Australian lighting has really moved on in recent years and one of those at the forefront of this push for more experimental concepts has been Volker Haug. HIs Brunswick East studio has now grown to nine employees and the work is receiving attention worldwide with press coverage as far afield as India. Earlier this year Volker Haug was one of the 26 Australian designers and studios that exhibited in Milan as part of Emma Elizabeth's LOCAL DESIGN. Volker Haug's 'Oddments' chandelier in glass and brass created a stir - as did his excellent bijoux stand that took out the DENFAIR Best Small Stand Award - for the second year in a row. Melbourne lighting company ISM Objects has been around since 1990 and continue to develop new and interesting ideas while attempting to keep their designs affordable. Founders Celina Clarke and Simon Christopher are still the brand's key designers and have always championed Australian designed and made. The two items below are shown here as renders but the lights are now in production. ISM Objects new 'Snag' light references the humble sausage but is quite a technological feat. The fitting can be as long as required with double snags only requiring one power cable as the second fitting transfers power from the first. Ism Objects new spun metal wall lights called 'Edo'. This design is in a style that many designers are interpreting at present but Ism offers their lights in an IP 54 rated form for use outdoors and in bathrooms. 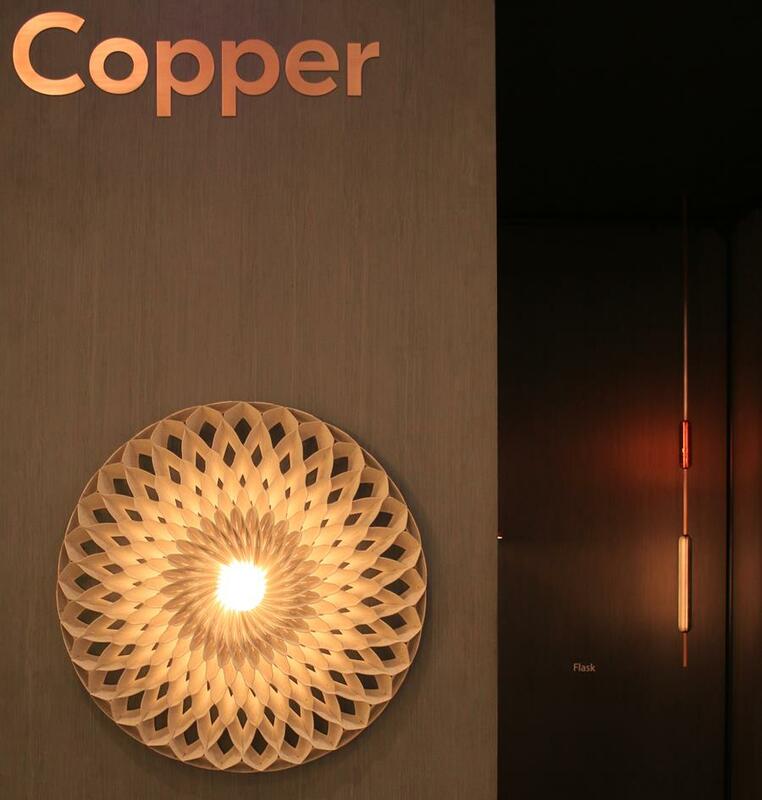 Another Melbourne brand that is continually developing new and exciting concepts is Copper. Founded by Edward Linacre and Viktor Legin in 2013, the studio produces furniture and lighting products and designs custom solutions for interior designers and architects. In the last couple of years their focus has very much been on lighting. 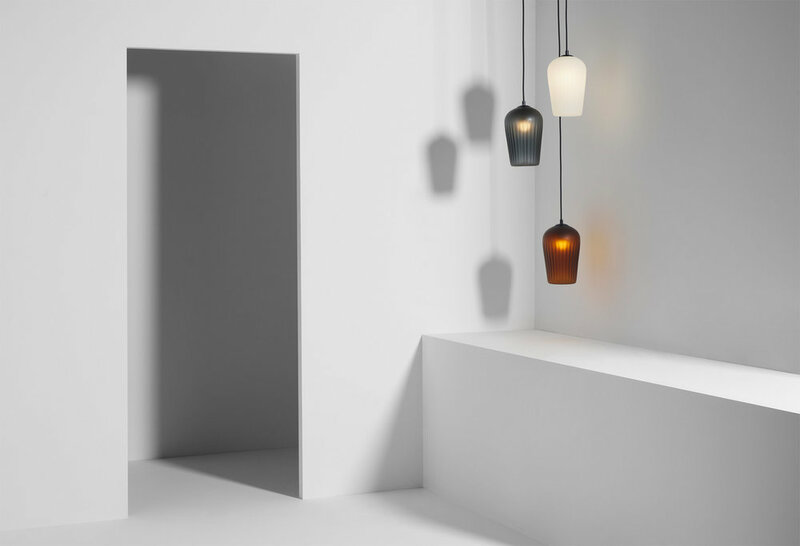 Their new 'Flask' lighting collection is a collaboration with glass artist Cain Lambourn of Foundation Glass. The front of the Copper Design stand featuring their now famous 'Sun' wall light and their new 'Flask' light in the background. Copper Design's new 'Flask' light - handblown glass and metal rods with internal dimmable LED. Multiple flasks can be positioned on the fitting and specified in a number of colours. 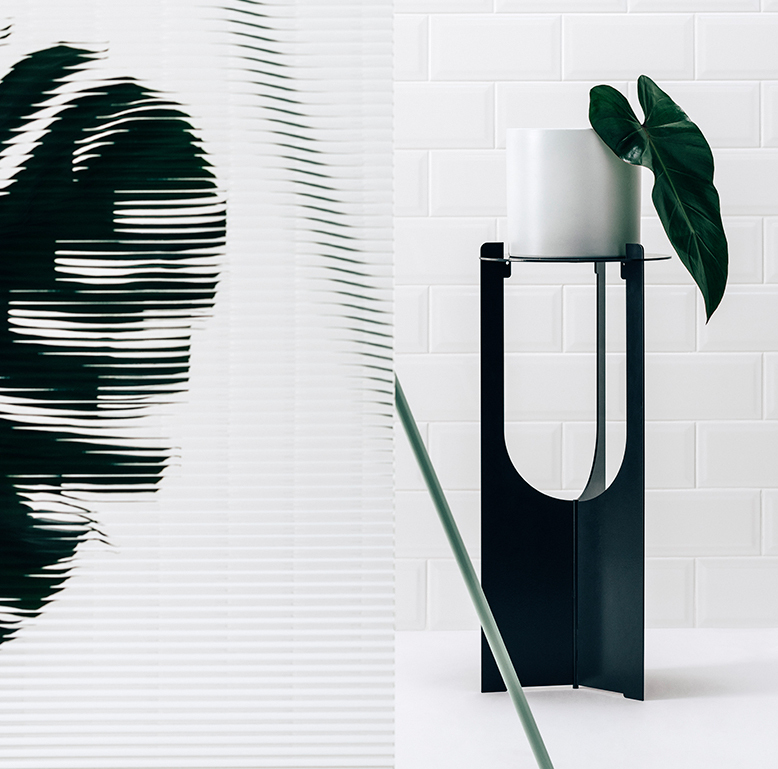 Presenting their wares in a way that was very in tune with the global trend for fluted glass, young Melbourne brand Idle Hands (Kieran Meegan and Rickie-Lee Robbie) showcased their capsule collection of pot plant stands (which double as side or coffee tables) called 'Platform'. The slot together powder coated steel tables come in cream, charcoal, matt or gloss white, horizon blue, matt black and opaline green. Launching at Denfair in 2016 Melbourne brand LAAL is the creation of brother and sister and Lydia Hnatojko. Previously showing their work in the ID. X THE SNAP young designers showcase section, LAAL have grown into a young brand that is happy to stand alone. Their highly graphic range of light fittings focus on cones and spheres supported by arched bars and perpendicular lines. A selection from the new LAAL collection of 'Samesame' stools and side tables and 'Conehome' lighting collection. The 'Conehome' arch and stick series pendant lights / chandeliers from LAAL. The first collection by young designers Andrew Beverage and Gabrielle Beswick for their brand Fomu, are a range of all black simple tables. While based around steel tube legs, flat steel shelves with black stained American oak tops, which is a very standard material mix these days, Beverage and Beswick manage to create a successful capsule collection with small but pleasing details. The cost of these tables is also surprising low, starting at $340. Beverage and Beswick are originally from Tasmania but have based themselves in Melbourne since founding their brand in 2017. Another new discovery for Design daily at DENFAIR 2018 was Melbourne based lighting company Lumil. Founder Luke Mills hails from New Zealand and is slowly bringing the rest of his family to Australia to work for him. Working with interesting materials like terracotta and recycled PET felt, the studio has created some exciting lighting designs. Shown below are Lumil's blown glass pendant 'Blend' and the linear terracotta lamp aptly named 'Tile'. The later also comes in wall single module mounted versions. Lumil's 'Blend' pendants in heavy blown glass. The flower bud shape is excentuated by verticals ribs and is available in numerous colours. Shown below are the 'Tile' lights from Lumil, made from slumped terracotta tiles. The design can be built to various lengths in increments of 250mm and can be applied horizontally as a hanging light or fixed to vertical surfaces. Adam Cornish is a designer who Design daily has always had a lot of time for. His work ethic is second to none and his work is always a cut above. This year at DENFAIR Cornish took out a joint award with Jon Goulder for BEST LOCAL PRODUCT. Goulder collaborated with Spence & Lyda on a beautifully crafted collection called Innnate, while Cornish worked with Melbourne outdoor specialist Tait on a folded steel outdoor dining chair called 'Seam' (shown below). 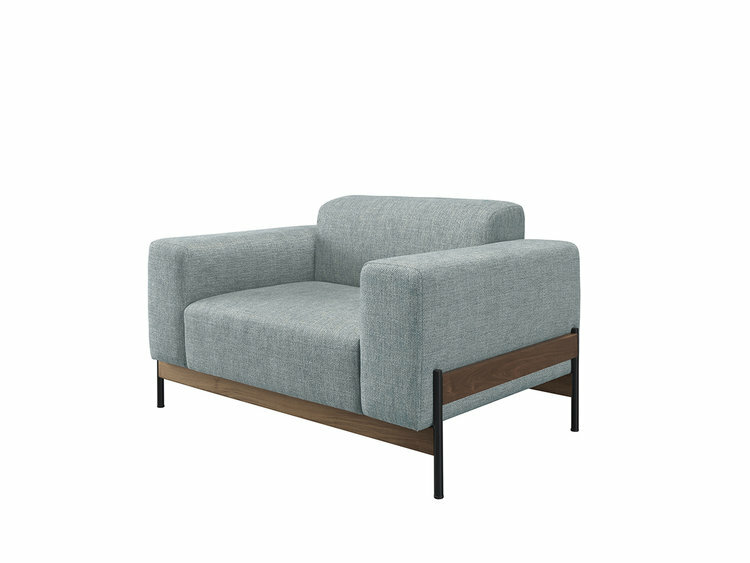 The 'Seam' chair by Adam Cornish for Tait. The Plyroom stand at DENFAIR 2018 - Autumnal colours and blonde plywood. Fiona Spence has been importing amazing furniture and lighting for over 20 years and now represents brands like De La Espada, CT Lighting, DCW Editions, Gras, Missoni and Pinch to name just a few. To create her own range Spence turned to Jon Goulder head of furniture at Adelaide's Jam Factory. Well known as the maker of incredible joinery with a particular interest in water-formed leather, Goulder has designed a collection called Innate that expresses a very Australian aesthetic using native Australian hardwoods rather than imported timber species like walnut and oak. The pieces are finished using techniques that seem to have been forgotten in the move to modern synthetics - pickling and waxing. The result, as you would expect from a collaboration of a super designer maker and retail doyenne, is nothing short of spectacular (in a quiet and understated sort of way). The pieces call out to be touched and are genuinely timeless in their refusal to embrace the current fashion for pastel colours and obvious shapes. Spence & Lyda's collaboration with Adelaide designer Jon Goulder resulted in the spectacularly crafted Innate collection featuring pickled Australian hardwoods woods and fine steel structures. Photograph by Felix Forest. Replaced was the latest in a series of exhibitions by the American Hardwoods Association showcasing their range of farmed hardwoods such as walnut, oak and cherry. This year was the turn of lesser known timber Tulipwood - a species America grows in abundance. The natural blonde to greenish variations in the timber makes it difficult to use on some designs but on Jon Guilder's 'Glissando' cabinet below, it worked beautifully. The American Hardwood's Association exhibition 'Replaced' showcased American hardwoods through collaborations with Australian designers. Featured here is Jon Goulder's 'Glissando' cabinet in Tulipwood. Standing out for its bold use of a single material, the Floc Studio stand was a little daunting to enter but once inside visitors could experience a number of European brands that are relatively new to Australia: Kristina Dam, Would and Wewood. Portuguese brand Wewood is one of Floc Studio's key brands. Based near Porto in the north of Portugal Wewood creates beautifully crafted pieces in solid timber across a wide range of categories. Shown below are their 'Bowie' armchair and 'Touch' cabinet. The 'Sentrum' side tables by Maximilian Schmahl and Fabian Schnippering for Danish brand Woud provides magazine / book storage on both sides of an S-shaped base. Available in warm grey and dusty green. Pictured below is the 'Annular' pendant by Canadian designers M-S-D-S Studio from Danish brand Woud - on show as part of Floc Studio's offering at DENFAIR 2018. The inviting chair on the right is the S.A.C. chair by Naoya Matsuo. Melbourne designer manufacturer Nicholls Design was funded in 2005 by Brad Nicholls and Sarah Woodhouse. The brand produces furniture that reflects the brands rural origins. The pieces are manufactured in solid timber and influenced by everyday functionality. Brad Nicholls Design stand at DENFAIR featuring the characterful 'Town & Country' sofa in oak and new woven timber screens. Featuring work by 22 finalists including Andrew Carvolth, Marie Lefebvre of Atelier Cayelle, Rene Linsson and Jack Balfour, the Front Centre exhibition brought the various Australian state design organisations together to select their best candidates. These institutions include Design Object Tasmanian, Craft ACT, Workshopped with the Australian Design Centre, Jam Factory and Craft Victoria. The Front / Centre exhibition, sponsored by highly established furniture company Schiavello. Shown in the foreground are the 'Archie' flat pack terrazzo tables by Victorian designer, Nancy Ji. The individual look of Atelier Cayelle's 'Nara' side table combines Kvadrat felted wool on the base and a turned timber top. Dean Norton's spun metal and mirrored glass 'Moodlum' tables and wall mirrors. Nicholas Fuller is one of the most talented designer makers in Australia today. Recently part of Emma Elizabeth's contingent that showed in Milan, Fuller comes from a background of studying under a master joiner (Scott Mitchell). In recent years Fuller has worked under the guidance of Jon Goulder at the Jam Factory but is soon to set out and establish his own studio. His 'Standing' screens have made him the talk of many a design magazine but he has recently backed this up with a beautifully made 'Standing' floor lamp (shown right) featuring the same granite base but with immaculately machined stainless steel and brass components. Shown below are new designs by Rhys Cooper (left) and Yellow Diva (David Walley and Felicity Joll) on the right. Cooper's new design reflect the recent interest in arched forms but he adds his own angular element to the classic form. The 'Arch' wall mirror made from oak incorporates a small shelf while the 'U' vase is cast ceramic in a range of glazes. The 'Hang Luxe' side tables from Yellow Diva are part of a range of items with the same name that include a valet and floor standing mirror. The side tables feature stone tops and withe r a stone or cast iron base with painted steel supports colour matched to the stone. Melbourne brand Zuster has come along way in the 20 odd years since it was founded by sisters Wilhelmina McCarroll and Fleur Sibbel. Their collections today are extremely luxe with beautiful materials and fabrics. A view into the Zuster stand at DENFAIR 2018 showing the graphic strength of the brand's new 'Contour' cabinets. Zuster's new bed features a highly tactile finish in ribbon stitched suede. That's it for another year for DENFAIR.......but no wait there is more! DENFAIR will also be in Sydney for the first time this year August 16-18. You can find out more details on their website here.